Never worth the full price but @ £14.99 for a wooden set I think it's a good buy, only 1 review but that is 5*, checked various postcodes & all had stock in or nearby. There's hours of fun and plenty of fire fighting adventures to be had with the Chad Valley wooden fire station playset. 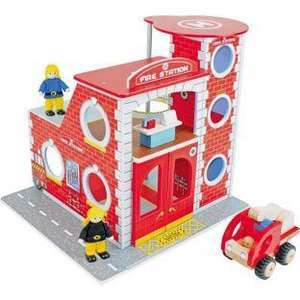 Get ready for your next exciting mission with this two storey wooden fire station. It has opening doors, a desk, phone, computer, locker and just the thing every fire station needs; a firemen's pole! Includes 2 wooden clothed and jointed firemen, 1 wooden fire engine with soft, chunky rubber tires and a helipad. For ages 3 years and over.. Reserved mine to collect tomorrow. Thanks!